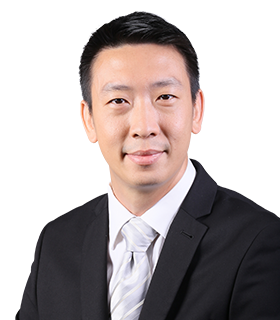 Dr Jonathan Teh Yi Hui is a Consultant Radiation Oncologist at Asian American Radiation & Oncology (AARO), the radiotherapy and oncology division of Asian American Medical Group. After completing his MBBS at the National University of Singapore (NUS) in 2002, where his record of academic excellence earned him multiple Dean’s List and Book Prize awards, he commenced a Radiation Oncology residency at the National Cancer Centre Singapore (NCCS) in 2007. Dr Teh received the Singhealth Health Manpower Development Programme Award for Advanced Training in Clinical Oncology in 2009 and worked as an Honorary Clinical Fellow in the Oncology department of the University College Hospital London from 2009 to 2011. During this time, he was trained in the delivery of radiotherapy and chemotherapy to cancer patients for both cure and palliation, focusing on genitourinary and gastrointestinal cancers as well as bone and soft tissue sarcomas. He also served as a member of the London Sarcoma Service, one of the largest such groups in Europe, providing patient care and participating in clinical trials. In 2011, he received the Fellowship of the Royal College of Radiologists (FRCR UK) in Clinical Oncology. Upon returning to Singapore, Dr Teh was admitted as a Fellow of the Academy of Medicine of Singapore’s (FAMS) Chapter of Radiation Oncology and served as a Consultant Radiation Oncologist in NCCS, again with subspecialty interests in genitourinary and gastrointestinal cancers, as well as bone and soft tissue sarcomas and paediatric cancers. In 2012, he was appointed a member of the NCCS Blood Transfusion Committee until July 2017 and was also awarded the Singhealth Doctor’s Long Service Award in recognition of his 10 years of commitment to quality patient care. Dr Teh’s current research interests include advanced radiotherapy techniques in prostate cancer treatment. He was the Principal Investigator of a Phase II Trial in Stereotactic Ablative Body Radiotherapy for Low-Intermediate Risk Prostate Cancer from 2013 to 2017, which was Southeast Asia’s first trial of this non-invasive treatment technique for prostate cancer. Dr Teh’s work has been published in international peer-reviewed journals such as the International Journal of Gynecological Cancer. He served as a reviewer for publications including Radiotherapy and Oncology and the British Journal of Radiology. His research has been presented at conferences and seminars in North America, Europe and Asia. He has also been invited to speak at major industry forums like the Singapore Sarcoma Consortium Sarcoma Symposium, Advances in Prostate Cancer Conference, Urofair and RadiologyAsia. Dr Teh has been actively involved in teaching medical students, residents and student radiation therapists as well as nurses. He has trained overseas radiation oncologists on attachment under International Atomic Energy Agency programmes. He was also an examiner for the Graduate Diploma in Radiation Oncology examinations in 2013, which was conferred by the Academy of Medicine, Singapore. Dr Teh is dedicated to the advancement of the profession and served on the Executive Committee of the Singapore Radiological Society as Honorary Treasurer from 2012 to March 2017. He was on the organising committee of the inaugural RadiologyAsia 2015, a regional radiology conference held in conjunction with the Singapore Radiological Society’s 24th Annual Scientific Meeting. He is a member of several international societies, such as the European Society for Radiotherapy and Oncology and the International Stereotactic Radiosurgery Society. Dr Teh has volunteered on multiple overseas medical mission trips and in a local welfare home. He believes that the best holistic medical outcomes can be achieved through constant pursuit of the latest medical evidence, attention to detail, and empathy for patients.